Fortunately, none of my children suffer from allergies. As a teacher, I have had many students thought that suffer immensely as spring time comes around. Even though it is only February, plants are beginning to bloom here in California. Allergies won’t be far behind. Normally, the immune system does not respond to mild substances like pollen and mold. But in sensitive individuals, the body’s defense mechanism views these allergens as it would an infectious agent and mounts an attack. Once the immune system has detected the “invader,” it unleashes a cascade of chemicals such as histamine and other compounds resulting in localized inflammation that leads to irritation and discomfort. How can you treat allergies naturally? Avoiding exposure to allergens is not always possible, but identifying which plants affect you the most and removing them from your yard can help. Otherwise, to relieve symptoms natural, homeopathy and essential oils are quite effective. We were sent Homeolab Usa Kids Relief Allergy Banana. Kids Relief Allergy Oral Liquid will help relieve your child of allergy symptoms including congestion, sneezing, and itchy throat, eyes, ears and skin. Its homeopathic formula makes it safe for kids of all ages – even infants – without worrying about the risk of overdose, harmful side effects, or drug interaction. Kids Relief Allergy Oral Liquid is also incredibly easy to administer; simply take the recommended amount of the liquid formula with the included dropper three times a day and watch as your child’s allergies begin to disappear! 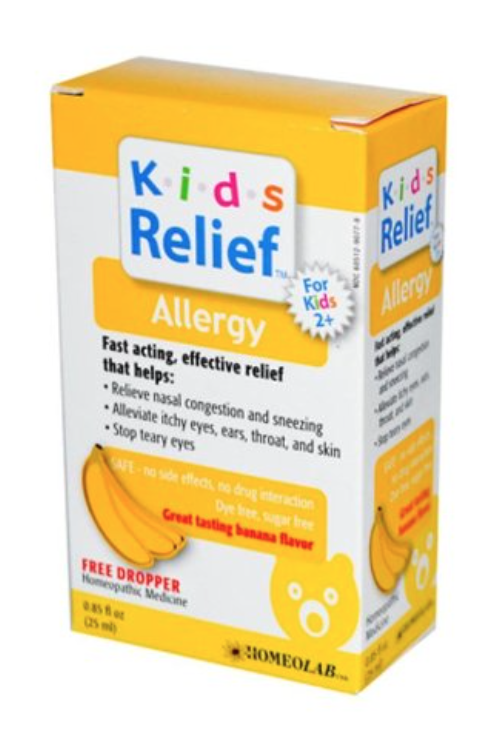 Kids Relief’s solution also has a great tasting banana flavor that will make it easy for your kids to take every day. This product is thankfully artificial dye free, which is uncommon in children’s medications. It is preserved with sodium benzoate and potassium sorbate. It does not disclose what the “banana flavor” is, and it makes no claim of being all natural. I cannot attest to the effectiveness of this product, as no one in my family suffers from allergies, but I have used homeopathy on many occasions with my children. It is safe and very effective, even with babies. In fact, my son received homeopathic treatment moments after being born to help him breathe. Homeopathy is based on the idea that “like cures like.” That is, if a substance causes a symptom in a healthy person, giving the person a very small amount of the same substance may cure the illness. In theory, a homeopathic dose enhances the body’s normal healing and self-regulatory processes. The ingredients in [amazon_link id=”B00O86E3SC” target=”_blank” ]Homeolab Usa Kids Relief Allergy Banana[/amazon_link] are designed to mimic the allergic symptoms in your child. Thus, their own bodies can provide symptom relief. Can essential oils help with allergies? There are many essential oils that enhance breathing. I use an essential oil diffuser in my children’s rooms whenever they have a respiratory illness with symptoms similar to seasonal allergies. My son is resistant to taking any oral medications. The essential oils diffused in his room offer him relief, especially at night when he sleeps. I would not recommend using peppermint oil topically around young children. It is very strong and can burn even diluted. I once put too much in my son’s bath. Lavender is a natural anti-histamine that provides relief! Well, essential oils are becoming more and more popular. I just hope even doctors will start using them to their patients and go all natural. Awesome post. Keep it up! Peppermint oil is considered not safe for young children. It can cause breathing to slow due to the menthol content. Please look up safety info on it before using. I do use it for myself and it works great for my congestion.